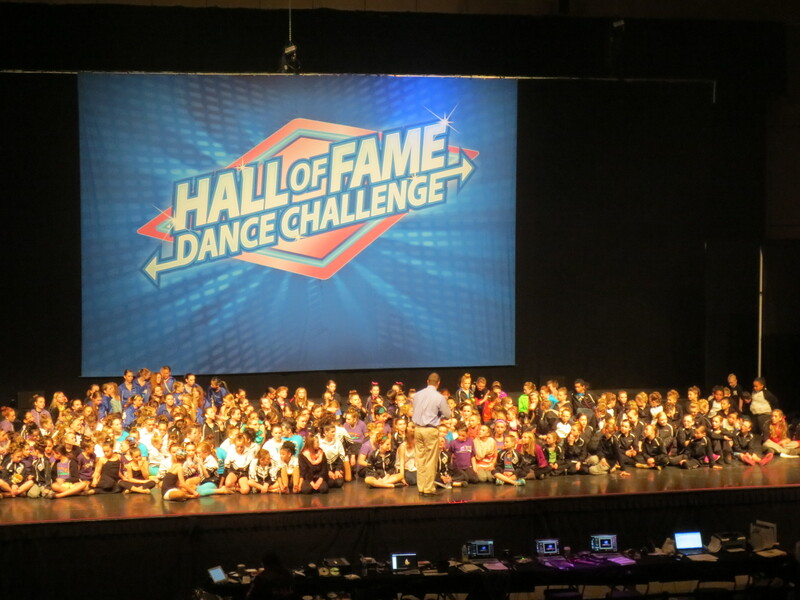 This past weekend, we attended the Hall of Fame Dance Challenge in St. Paul, MN. This is Grace’s 3rd year dancing competition, and it was her 3rd year attending Hall of Fame. I wrote about the first year (which, I believe was also her first competition ever). That year, she was dancing for Eau Claire School of Dance. I also wrote about last year’s competition. We had moved to MN, so this time, Grace was dancing for Lake Area Dance, where she continues to dance. *It didn’t seem as dark this time, which was helpful. It was nice to be able to find your way around more easily and read the program. *There were still 2 stages, back to back. The 2nd level dressing areas were open, but blocked off with curtains, so as not to be so distracting to the dancers on the stage. I think in the past, this was not the case, and there was often a lot of commotion at the back of the room. There also used to be a dressing room area (partitioned off with curtains) at the back of the room with Stage 2. I did not see it this time. *The Stage 2 side seemed to have been bigger in the past 2 years. I’m not sure if that’s because of how they blocked off the areas, some other reason, or if it’s my imagination. What I do know, is that the few times this weekend that I was watching Stage 2, it was standing room only. *While the competition ran ahead of schedule on both stages, there was less skipping around than in years past. They did allow a few dances to go early due to costume change needs, or skip a group who wasn’t ready, etc. For the most part though, it seemed like they tried to stay mostly on track. Grace’s first dance of the day was about 50 minutes early. Unfortunately, this meant that some of her family that was watching live or online, missed the first dance. I know this was the case for others as well. *There was a professional photographer taking pictures again this year. I did not know about this feature at this competition until after the fact last year. One of the girls in Grace’s group said, “Hey, let’s go look at the pictures”. I asked where they were. The table of laptops for viewing photos was in the back of the area where Stage 1 was. To view them, your back was to the dancers on the stage. It was somewhat hidden unless you happened to know they were there, or came in on that side. Photos were pretty pricey at $25 for one photo. If you bought an entire dance, the prices got better – $45 for the first dance, $25 for the 2nd, and $15 for the 3rd. One of the moms was able to work out a “studio package” for a great price. Thank you to Hall of Fame to honor the studio package deal even after I purchased all 3 of Grace’s dances. *Prices at their boutique were fairly reasonable. The programs were $10. I thought the shirts were a bit expensive at $25 for any t-shirt. That said, I thought the price was decent for the one that was all blinged out in rhinestones, that I got for Grace. They also had sweatpants for $35 (which Grace got, and said were super comfy), and some really cute (and soft) hoodies for $40 (I think). I didn’t end up getting the hoodie, because I only had so much money to spend that day. I really liked them though. *One of the things I love about Hall of Fame, is that they live stream the entire competition. Grace’s dad had to work the day she danced, but he was able to watch her dances online from work. We also had some friends from Eau Claire School of Dance watching and cheering for her online. Sunday, we had a lot going on at the house, and weren’t available to go back to St. Paul to watch the dancing. While we ended up missing the dances themselves, we were able to watch the awards ceremony, and the American League dances that were going on all afternoon (think best of the best of the Twin Cities). Grace is getting to an age where she wants to do more hanging out with friends, and is less dependent on me. She spent much of the afternoon hanging out with them. I tried to give them plenty of space, though we often ended up near each other anyway. She kept inviting me to sit near them, and I was trying really hard to just give them space. That said, a group of 10-12 year old girls can be quite entertaining to listen to! As for how the day went, it started out with us getting there at about 8 am. This was about 2 hours before they were scheduled to dance. Several of Grace’s teammates were still performing their solos. Grace got her lyrical costume and lipstick on, and waited. Dancer lesson of the weekend, if you are in your costume, you should be stretching/warming up… even if you are waiting. In just over an hour, the girls ended up competing. As I previously mentioned, 50 minutes earlier than scheduled. Unfortunately, because of the timing, they also didn’t get a lot of time to warm up together. Obviously, they do well under pressure, because they did a great job! Their second dance of the morning was jazz – “Cold Hearted Snake“. It was the best I had ever seen them perform it (though, at least one of the dancers will tell you otherwise). Third was their tap dance. Their dance is fast, hard hitting, and takes a lot of maneuvering around and on top of desks. The chair Grace was supposed to step on to get up to the desk had fallen over. She had to act fast to get up to the desk without missing a beat (which also meant without messing up her arms). She somehow was able to pull it off. So awesome. Afterwards, one of the assistants came up and congratulated her on her save. I thought she was going to pee herself, she was so excited. Thank you Lexie for making her day! Anyway, I thought they were spot on with their dance. I was excited for awards!! Hall of Fame has 3 levels of competition. There is the Rookie League (recreational), National League (Intermediate), and American League (Elite). Levels are based on how many hours a week the dancers study, and how much competition experience the dancers have. Lake Area Dance typically dances at the National League level, with some of the younger dancers and small groups competing at the Rookie League Level. All dances are given a score, and an “adjudication award” based on that score. Whenever they say “adjudicated”, I hear someone near me ask what that means. I was one of those people Grace’s first year in competition. I don’t remember them doing this back when I danced competition. Anyway… all dances are given either a silver, gold, high gold or platinum. 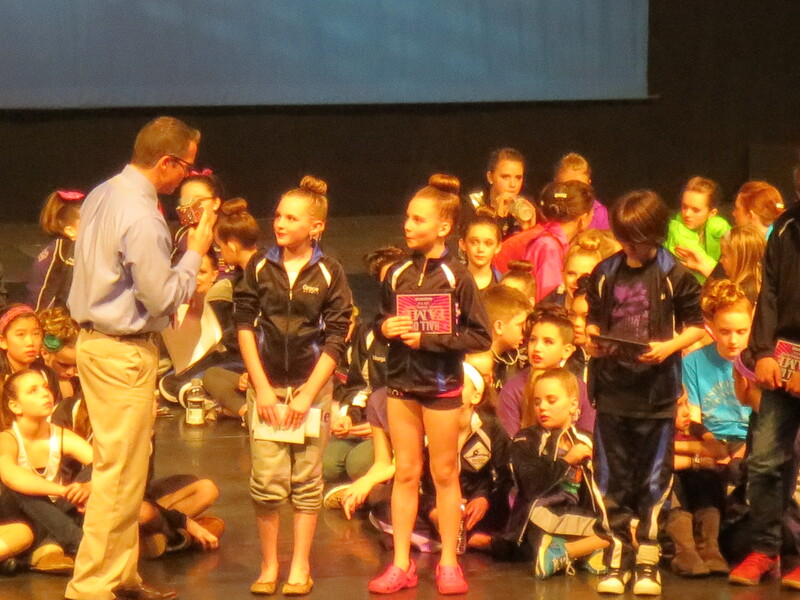 All dancers are given a pin with their scored level, a plaque is given to the studio. Once all the scores are given out for every dance, they rank the dances. The number of places they acknowledge depends on the number of dances in a category. It was a very exciting day for the Lake Area Dance (LADC) Angels (Grace’s group)!! They got 1st Place Platinum for all three dances. I believe the 1st place before the platinum means they got first in their specific age/style category. They took 1st place for their lyrical dance, 2nd place for jazz, and 3rd place for tap! There are also many special judges awards. Lake Area Dance was given a choreography award for “Tears of an Angel”, their lyrical dance (choreographed by Mike Dietz). One of the dancers in Grace’s group was given an intensity award for her solo. After the placement awards, there were Best in Category awards given out. For solos, two dancers from LADC took best overall jazz solo, and best overall lyrical solo. For large group dances in the Junior National level, “Cold Hearted Snake” took best overall jazz dance, “Tears of an Angel” took best overall lyrical. Congratulations to Woodbury Dance Center in having the highest scoring tap dance of the morning! After awards, Grace wanted to stay and hang out with her friends, and watch the teens dance. I’m so glad we did! We have some pretty amazing dancers, as do other studios. It was great to be able to sit back and watch without having to run back and forth in between dances to make sure Grace is changed and has everything she needs for the next dance. A couple of things happened while I was watching the girls (and Daniel) dance that made me really proud. While the girls were doing their jazz dance, I heard a couple of women behind me comment on how good they were. I couldn’t help but smile at that! I also had a couple of different people stop me and ask where Lake Area Dance Center was located. Now that I have a dance jacket, I make sure to wear it at competitions. After awards, I had a few more ask me. They are definitely making their name known with their excellent dancing, choreography, and awards! No, our studio is not doing the Hall of Fame Nationals. They actually did Masquerade this past week in MN.